4310 DELUXE MIXED NUTS – 12 OZ. Attractive tin has dark green lid and gold base. Shipping weight: 2 lbs. Measures 6 5/8” diameter x 1 3/4”. Case pack: 12. Prices shown per piece. Engraving area: 4” diameter. 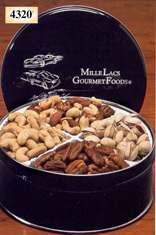 4370 DELUXE MIXED NUTS IN SOLID RED TIN – 20 OZ. Shipping weight: 3 lbs. Measures 6 7/8” diameter x 2”. Case pack: 12. Prices shown per piece. Engraving area: 4” diameter. 4365 CASHEWS – 12 OZ. Another favorite! Dark green tin lid with gold base. Shipping weight: 2 lbs. Measures 6 5/8” diameter x 1 3/4”. Case pack: 12. Prices shown per piece. Engraving area: 4” diameter. 4342 CASHEWS IN SOLID RED TIN – 20 OZ. Shipping weight: 3 lbs. Measures 6 7/8” diameter x 2 11/16”. Case pack: 12. Prices shown per piece. Engraving area: 4” diameter. 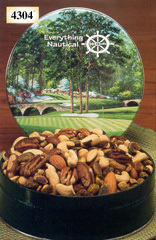 Twelve ounces of a 50-50 mix of Deluxe Nuts and Pistachios come in a collectible Golf Tin. Shipping weight: 2 lbs. 6 1/2” diameter x 1 3/4”. Case pack: 12. Prices shown per piece. Engraving area: 3” x 2”. Eight (8) ounces of plump almonds coated in milk chocolate. An oval imprinted label will show off your logo. Shipping weight: 2 lbs. Measures 6” diameter x 1”. Case pack: 12. Prices shown per piece. 11.5 oz. 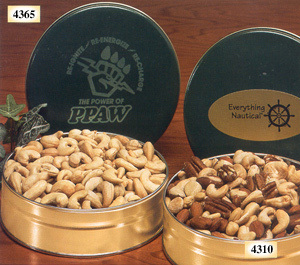 of our roasted Pecans, Cashews, Mixed Nuts and Pistachios. Shipping weight: 2 lbs. Measures 7 1/4” diameter x 2 11/16”. Case pack: 6. Prices shown per piece. Engraving area: 4” diameter. Sixteen (16) ounces. Personalized tin lid with an imprinted label or laser engraving. Shipping weight: 3 lbs. Measures 6 1/8” x 6 1/8” x 1 7/8”. Case pack: 12. Prices shown per piece. Engraving area: 3” x 1”.